Photographer Matthew Carden’s incredible “Small World” food photography offers an entirely new perspective on the foods we consume, interspersing tiny figures amid towering broccoli treetops, massive mushroom forests, and colossal candied yams. His work aims to “make viewers more aware of what they eat, and to think about food as an integral part of our world.” Each edible landscape is a provocative close-up investigation of the foods that sustain us. With the Thanksgiving holiday just behind us, and the leftover food now before us, Carden’s work feels especially relevant. Take a fresh look at food and the way we consume it with Matthew Carden’s innovative art. 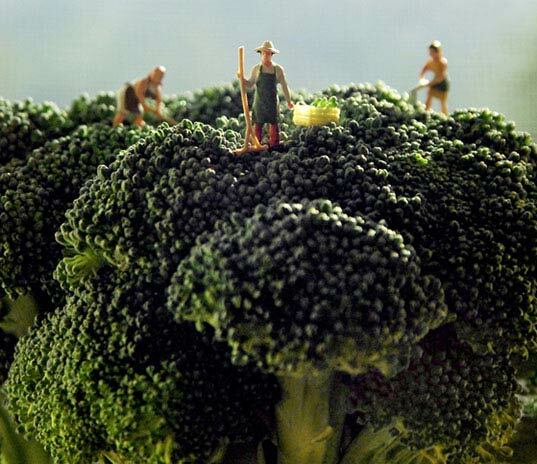 Photographer Matthew Carden's incredible "Small World" food photography offers an entirely new perspective on the foods we consume, interspersing tiny figures amid towering broccoli treetops, massive mushroom forests, and colossal candied yams. His work aims to "make viewers more aware of what they eat, and to think about food as an integral part of our world." Each edible landscape is a provocative close-up investigation of the foods that sustain us. With the Thanksgiving holiday just behind us, and the leftover food now before us, Carden's work feels especially relevant. Take a fresh look at food and the way we consume it with Matthew Carden's innovative art.